commented on "The huge crowd that attended Nelson City's Dawn Service at Trafalgar Park on Anzac Day this year testifies to the honour and respect we ..."
The huge crowd that attended Nelson City's Dawn Service at Trafalgar Park on Anzac Day this year testifies to the honour and respect we have for those who went before us and have a story to tell from World War I,whether at home or at war. As the Nelson City CouncilWW100 Centennial Commemorations Liaison Coordinator, it was a privilege to be part of the committee that organised this dawn service marking the centennial of the Gallipoli landings. 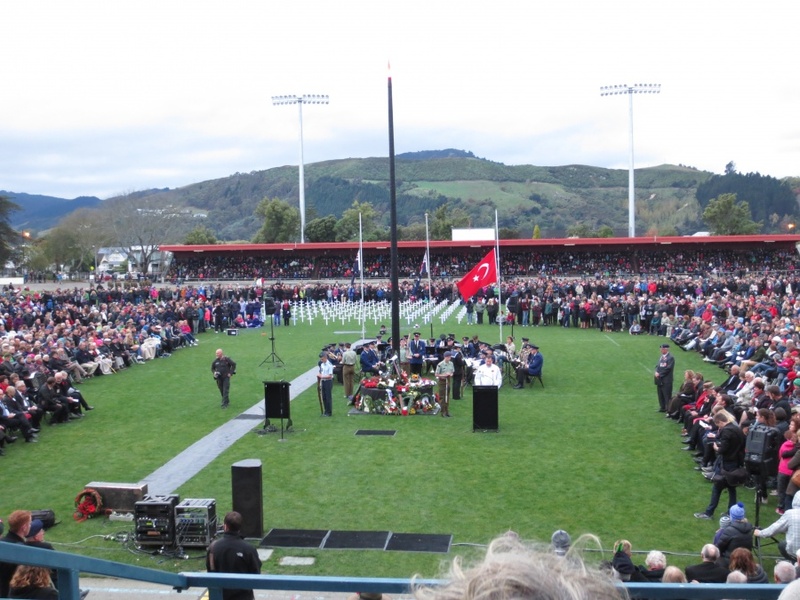 We knew it would be a big event but we were overwhelmed when around 10,000 people, rather than the 5,000 we anticipated, poured into Trafalgar Park to be part of the service usually held at the much smaller Anzac Park. It was wonderful to see so many people prepared to get up before dawn to mark their respect. It was a lovely project to be involved in and with several more years to go for the war's centennial, no doubt there is more to come. We will remember them. Here's an image I took once dawn had broken, looking from the Trafalgar Pavilion across Trafalgar Park to the temporary cenotaph, the field of remembrance (with 590 white crosses named for each man who died in service during WWI) and the eastern stand.